While the average American eats almost 200 sandwiches a year -- more if you count pita with peanut butter and leftover pad thai as a sandwich -- eating bread filled with stuff is as universal as loving David Hasselhoff (eating sandwiches on the floor). 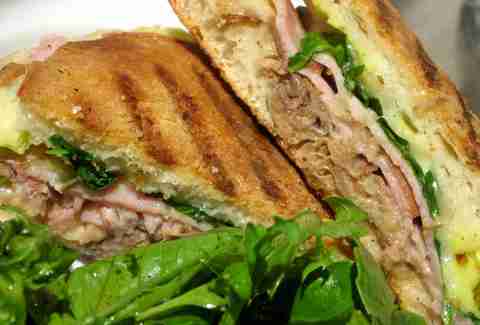 When it comes to global gastronomy, the sandwich reigns supreme. 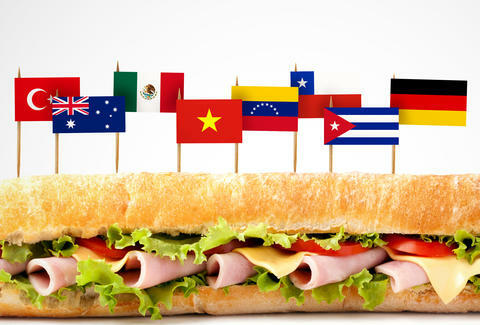 Which is why we put together this handy guide to the world's best/most representative national sandwiches. What’s in it: As you've probably annihilated one of these from a street cart late night, you know that Döner is meat (beef, chicken, lamb, or veal) cooked on a vertical spit, enveloped in a pita hug, and supplemented with onions, pickled cucumber, lettuce, and tomatoes. Fun fact: Döner Kebab (which literally means turning meat) was reportedly invented in Berlin in 1971 by a Turkish immigrant, Mahmut Aygünin (aka. "kebab king"). What’s in it: Why is the dude in Men At Work's "Down Under" smiling when he "gives you a bite of his Vegemite sandwich"? Probably because he's giving you toast smeared with brown paste made from leftover yeast extract, a by-product of beer-making. 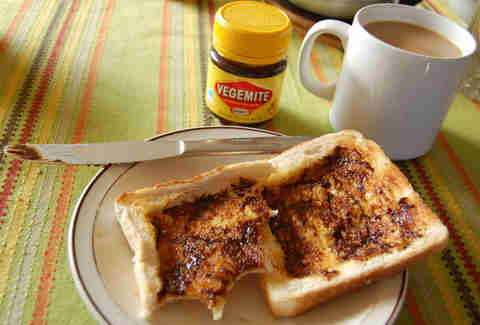 Which some Aussies eat with cheese for breakfast. No wonder so many Aussies leave home to travel the world. 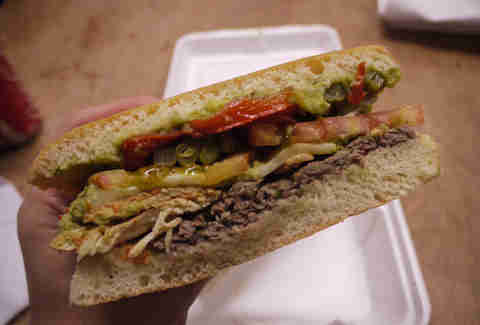 What’s in it: Delicious egg-based, brioche-like bread is usually topped with layers of sliced avocado, meat (most likely deep-fried beef), white cheese, onions, herbs, and salsa roja. 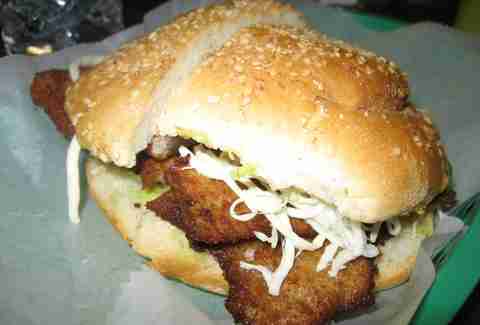 Fun fact: Originally from Puebla, the word "cemita" refers to both the sandwich and the bread it employs. What’s in it: Bánh mì is actually Vietnamese for bread, especially the French-introduced baguette that houses the sandwich of the same name. The filling is basically a free-for-all hybrid of Viet-Franco ingredients: mayo, cilantro, garlic and fish sauce, cucumber, pickled carrots, plus either barbecue pork, fried tofu, pork belly, and ham, plus some pâté thrown on for good measure. Fun fact: It was allegedly invented in Vietnam in the early '20s by Le Vo, a smoothie street vendor clearly ahead of his time -- smoothies! In the '20s? 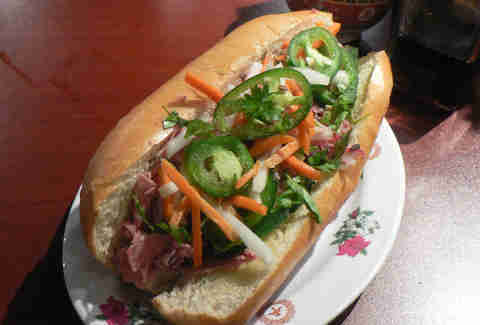 After closing up shop to escape the war in 1972, he landed in San Jose, CA and opened Ba Le Bakery, oft cited as the first Bánh mì joint in the US. What’s in it: Arepa technically refers to a crispy, yet chewy, maize-dough flatbread, but the sandwiches -- lil' pockets of heaven -- are also known as arepas, and are filled with pretty much anything you could ever want: from chorizo and plantains, to beef, pulled pork, cheese, and avocado. Think of it as a taco 2.0. And one of the best breakfasts you'll ever have. Fun fact: In Venezuela, arepa-making kitchen appliances are as commonplace as waffle irons in... Belgium? 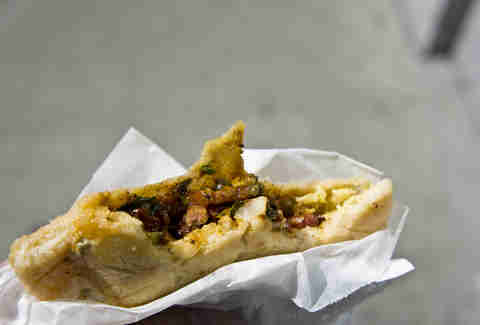 More importantly, the arepa owns the crown our top breakfast food in the entire world. What’s in it: You've gotta love any food specifically designed for post-bar consumption: Medianoche literally translates to “midnight”, and it's a late-night staple originally served in Havana’s clubs around that time. Interestingly, it was also a go-to for workers in the sugar and cigar factories burning the midnight oil. Made on a soft egg roll, it’s like a grilled-cheese-ham-and-more-cheese-hybrid made of roast pork, Swiss, ham, pickles, and mustard, all warmed on a press. 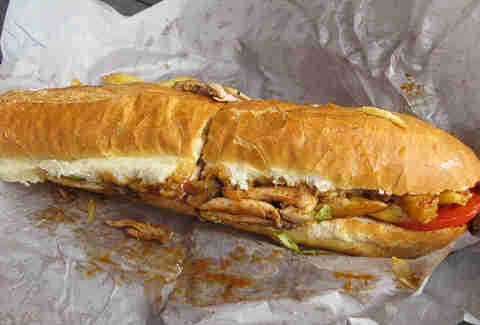 Fun fact: In April 2012, a version of the Medianoche was named the "signature sandwich" of the city of Tampa, Florida. Look at you, Tampa, all hip and cool with your own signature sammie. Fun fact: Did Chile invent the farm-to-table trend? Chacra means farm, and refers to the chacarero's farm-fresh fixings. What’s in it: While Germans are usually known for being precise, turns out they've also got a bit of a prankster side. Literally, “Leberkäse” means liver cheese (which sounds gross), but in reality, this sandwich includes neither -- and is delicious. Served hot and with sweet mustard, basically, it’s Mom’s meatloaf (if your Mom is German) on a Kaiser roll. 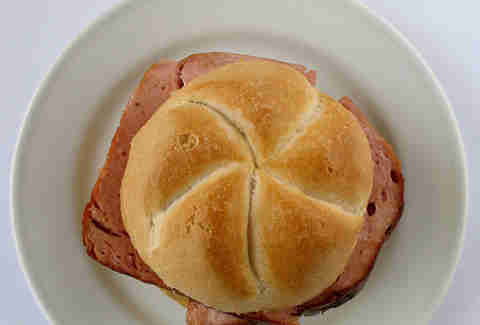 Fun fact: According to German food laws (yes, they have laws for everything), only products called "Bavarian Leberkäse" are allowed to (thankfully) omit the liver; otherwise, there must be a minimum of 4% liver content. Fun fact: We thought that looked like a schnitzel. 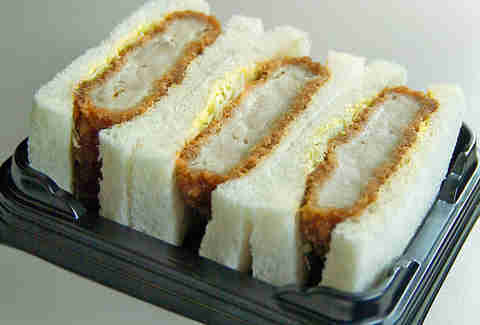 Invented in Tokyo in 1899 at a restaurant called Rengatei, the sandwich was originally considered a type of yoshoku -- a Western dish with local influences. What’s in it: Fun to say, fun to eat. Remember when you were a kid at McDonalds and shoved fries into your burger and thought you were a genius? 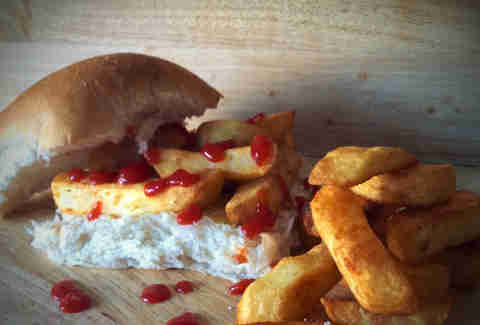 Well, the chip butty is basically that, but sans meat. Yup, bread, fries, ketchup, and whole lot of carbs if you're still doing the Atkins. Which you shouldn't be because... well, just because. Fun fact: Apparently, the word butty has nothing to do with junk in the trunk; rather, it's a contraction of "bread and butter". 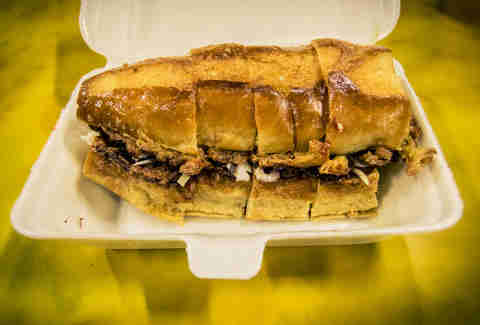 Originally considered a working-class meal, it also makes a cameo in a football chant for Sheffield United supporters, "The Greasy Chip Butty Song", and acted as a power-up in video game Earthworm Jim 2. 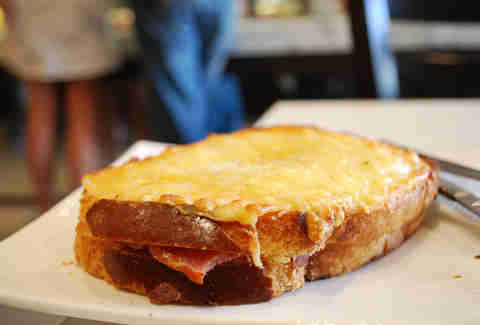 What’s in it: In typically Francophone fashion, the Croque Monsieur is like something American, but fancier; it's essentially a grilled ham and cheese sandwich made with Emmental or Gruyère. And the cheese is ON TOP OF THE BREAD. 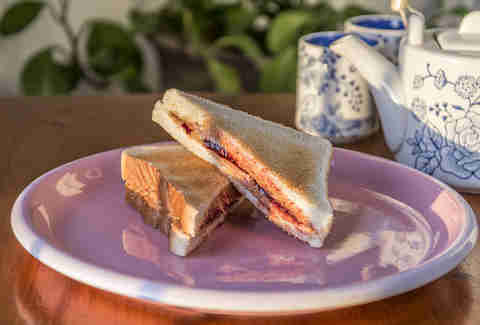 Fun fact: Having originated in French cafés and bars as a snack around 1910, the sandwich boasts a proud literary heritage -- its earliest mention is allegedly in volume two of Proust's In Search of Lost Time (1918). 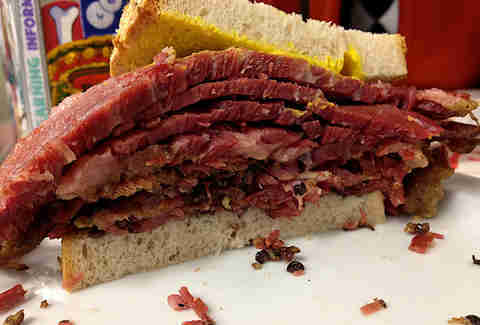 What's in it: Kosher deli meat made by salting and curing beef brisket in spices, and letting it sit/ absorb for over a week, this Montreal speciality is stacked high on rye and topped with mustard. Fun fact: Montreal smoked meat is always sliced by hand and lots of bits fall off in the process; they're usually served in a smoked meat poutine, over spaghetti or even on pizza. That's not all: Montreal-style smoked meat sandwiches can be ordered by the amount of fat in the meat, with five options ranging from lean, old-fashioned, and "speck", which is basically only fat and no meat. 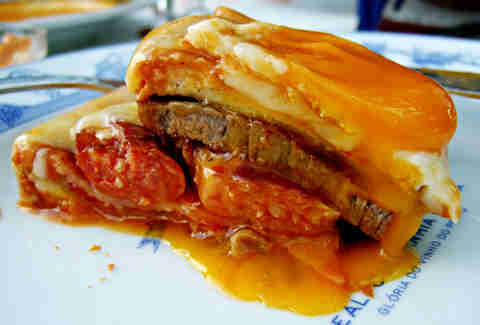 What's in it: Kind of like a shiny lasagna floating in oil, the Francesinha's made of bread, ham, linguiça, fresh chipolata sausage, and steak -- all covered in melted cheese and drenched in a beer sauce. The sauce is almost always secret (beer being the one constant ingredient) and diners are known to rate sammie-serving restaurants based entirely on the quality of their Francesinha. Fun fact: Also known as "Little Frenchie", the Francesinha was created in the 1960s by a French/ Belgian emigrant trying to invent a Portuguese Croque Monsieur. 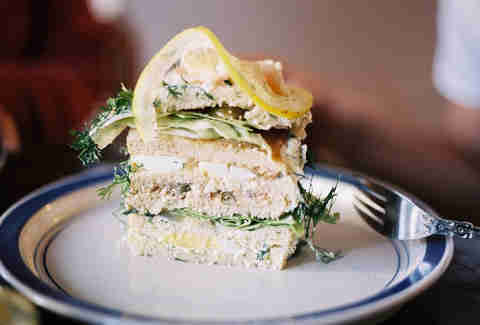 What's in it: Smörgåstårta translates to sandwich cake in English, which is the best. 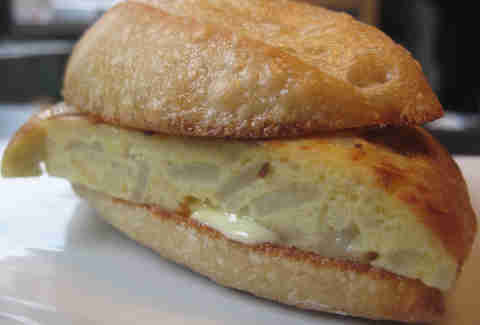 This tasty handheld sammie's made by layering rye bread with creamy fillings (egg, mayo, etc.) and a smorgasbord of ingredients including liver pâté, olives, shrimp, ham, and caviar. Also, tomato, cucumber, grapes, lemon slices, and cheese. And smoked salmon. Fun fact: The Smörgåstårta's so delicious that the police are known to accept it as a bribe. Well, at least one cop did. Old people also go nuts for it. What's in it? A croquette is a small breadcrumbed fried roll usually made of mashed potatoes, but often mixed with ground meat, shellfish, fish, cheese, or vegetables. 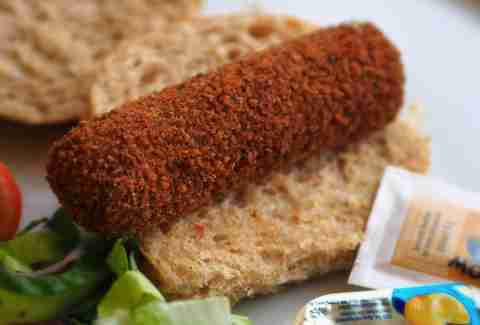 The Dutch are obsessed with them and the Broodje Kroket, a croquette on a bread roll, is sold all over the country. Fun fact: McDonald's even sells a "McKroket" in the Netherlands. And also beer. Because foreign Golden Arches are just awesome. What's in it: Sometimes spelled Wada Pav or Vada Paav, India's favorite handheld is a spicy veggie hamburger that consists of a batata vada potato fritter sandwiched between two slices of pav bread. It usually comes topped with a chutney made from shredded coconut, tamarind pulp, and garlic. Fun fact: While the Vada Pav started as food for the poor (it's cheap to make), it quickly caught on nationwide and is now one of India's favorite fast food dishes, yet is also served in the fanciest of hotels. What's in it: Like a good ol' American hoagie, anything goes, and unlike a good ol' American hoagie, the Gatsby always includes a layer of fries. Made on a massive roll, it's designed to feed a family of four, which explains why it's sold in full, half, or quarter sizes. Fun fact: Gatsbies were said to have been birthed in 1976 in Cape Town by an industrious fish and chips shop owner, Rashaad Pandy, who -- upon running out of fish -- had to find a way to feed a boatload of hungry day laborers. What's in it? Poland's most popular fast food, a Zapiekanka (which means "to scorch" and is commonly referred to as a Zap for short) is an open-faced baguette topped with any number of meat/ veggie fixings, but never without melted cheese. Fun fact: A popular variety of Zapiekanka is the "student's Zapiekanka", which basically means that you throw whatever dregs you can find in your fridge on top. What's in it? 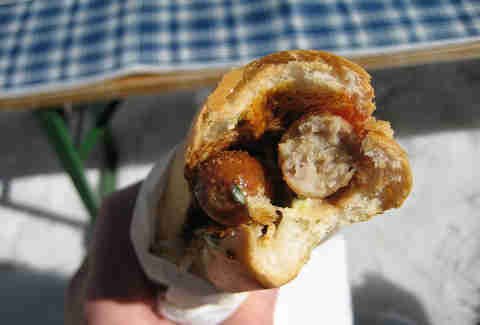 Austria's answer to America's hot dog (or is the hot dog America's answer to the Austrian Bosna Wurst????) 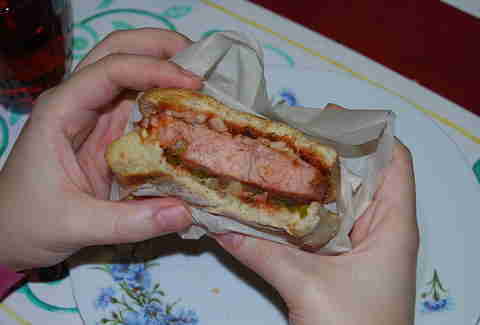 and an equally popular fast food dish, Bosna's a spicy bratwurst sausage with onions and a blend of curry powder, ketchup, and mustard in a grilled white Kaiser roll-like bread. Fun fact: While originally called a Nadanitza, the name proved too difficult for Austrians to remember and it was changed to Bosna, which referred to Bosnia, a country Austrians associate with spicy food. 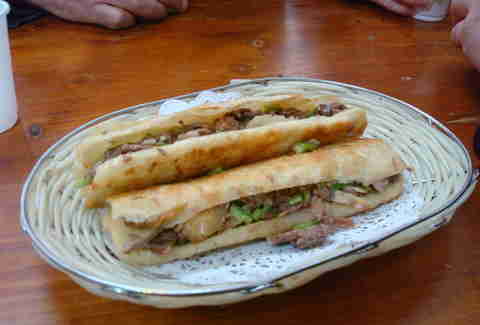 What's in it: A beloved breakfast/ snack in Malaysia, as well as Brunei and Singapore, the Roti John is essentially an omelette sandwich on a baguette-like bread, but can be dressed up with other ingredients, including minced meat (chicken or lamb), onion, and sardines with a tomato-chili sauce. Fun fact: 'Roti' is Hindi, Urdu, and Malay for bread, but the word John crept into the sandwich's name as a proxy for all things Western, namely the type of bread and tomato sauce. 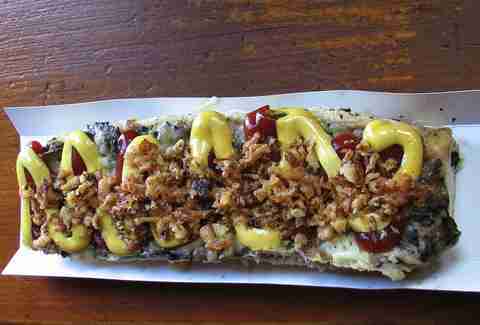 What's in it: This street food is essentially a hot dog-burger-hybrid, made with white bread and a half-inch slice of pork sausage, usually complemented by diced onions, chopped pickled cucumber, ketchup, mustard, and sometimes mayo. Fun fact: Legend has it that the Porilainen was invented by broke students in the '50s/ '60s looking for a cheap, filling meal they could make on the small grills in their dorms. 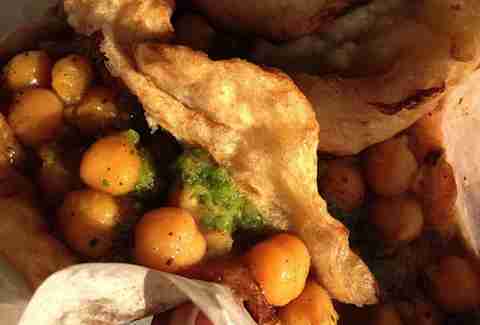 What's in it: Often eaten for breakfast, this common street food's made of two flat, fried pieces of bread filled with curried chick peas and topped with mango, a local type of cilantro, cucumber, coconut, tamarind, and pepper sauce. What's in it: This favorite Spanish tapas consists of a Tortilla Española -- basically an omelette with potatoes and onion -- souped up with meat (anything from dry-cured ham, chorizo, chicken, pork, or tuna) and seasoned with sauces like mayo, aioli, or tomato sauce. 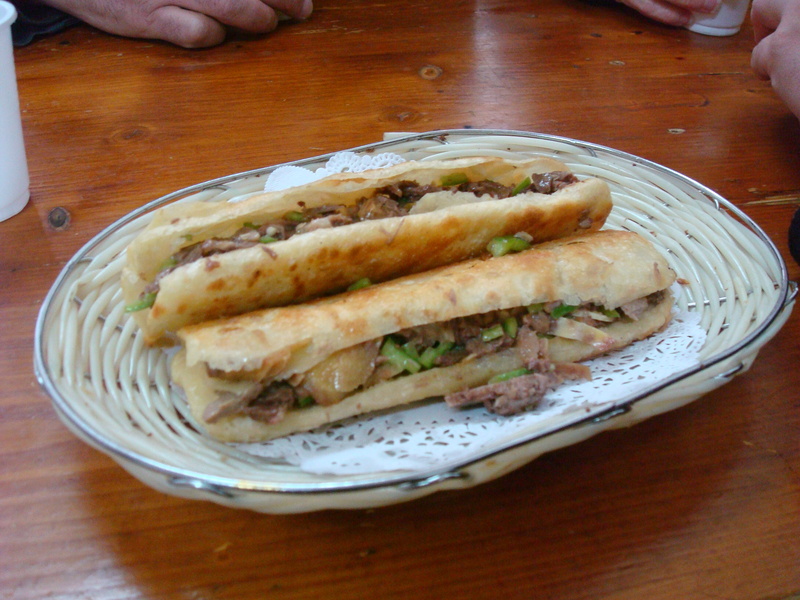 Fun fact: There are two types of sandwiches in Spain: a “sandwich” is made with white bread and is pronounced in the way bad newscasters say Kneee-car-aaaahh-gwwaaah -- with a Spanish accent -- while a traditional Bocadillo uses a rustic barra de pan bread. 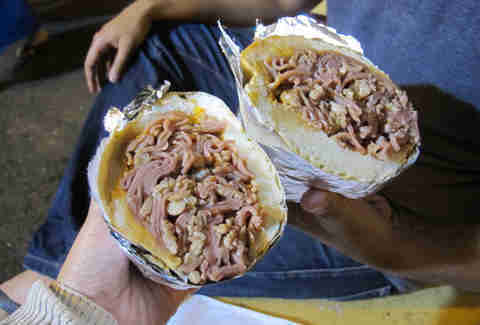 What's in it: There are endless variations, but generally a tripleta consists of three grilled meats (beef, roast pork, chicken, or ham) and some combination of crispy potato, plantains, and cheese, plus your standard complement of lettuce, tomato, pickle, and onion. Fun fact: Also known to gringos as a Tripleton, the bread used is a typical Puerto Rican pan sobao, which is -- like your girlfriend in eighth grade -- soft and sweet. 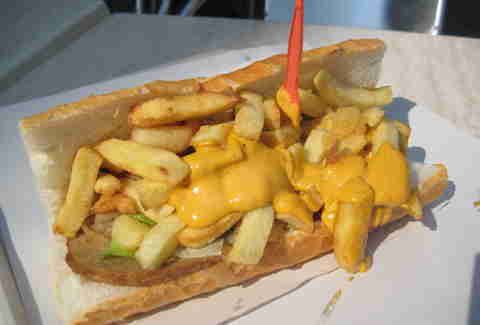 What's in it: Similar to the English chip butty, this Belgian breadstuff is a demi-baguette loaded with fried meat (sausage, burger, steak), covered in salty fries, and then doused with mayo, ketchup, and one of any number of sauces including Andalouse or Bearnaise. Fun fact: Although Mitraillette literally translates to "submachine gun", not surprisingly, it's alternate moniker is the "Américain". What's in it: We're guessing this is where the term smorgasbord comes from, because when it comes to this sandwich, literally anything goes. ANYTHING. Originally known as Smør og Brød, or "butter and bread", these babies usually comprise a piece of buttered rye bread topped with, well, something. The caveat? 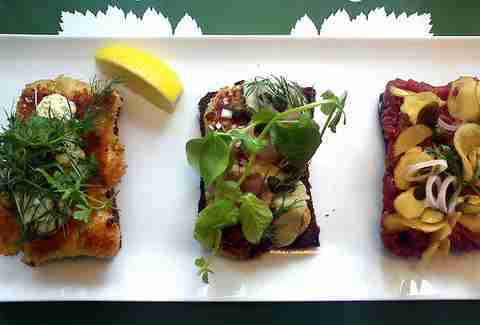 A visual people, the Danes try to make these open-faced sammies aesthetically pleasing, even when eating alone.